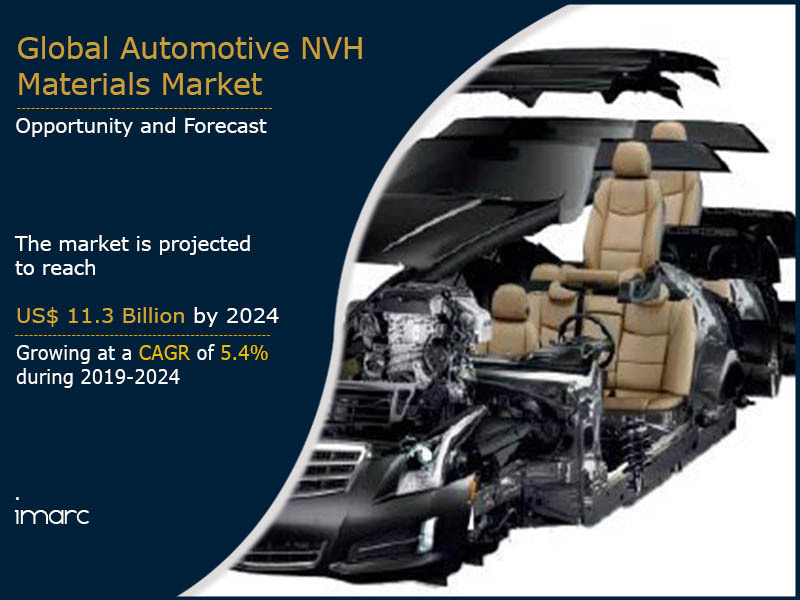 The global automotive NVH materials market was worth US$ 8.2 Billion in 2018. Automotive NVH materials, also known as noise, vibration, and harshness materials, are used to reduce unwanted noise, vibrations (oscillations due to automobile mechanics), and harshness (the level of discomfort) in automobiles. NVH materials, including molded rubbers, metal and film laminates, molded foams and engineering resins, are used to control air and structure-borne noises as well as noise generated from the interior components of the vehicles. In recent years, there has been a heightened demand for NVH materials as they absorb noise and prevent it from entering the vehicle, thereby preventing discomfort and improving the ride quality. Over the past few years, the sales of automobiles in emerging regions like India and China have been rising steadily. The strict government regulations for reducing vehicle noise levels are increasing the demand for NVH materials in these regions. Moreover, several manufacturers are developing lightweight vehicles with enhanced fuel efficiency which helps in improving the noise and vibration quality of the vehicles. They are also focusing on mergers and acquisitions (M&A) to enhance their portfolio for NVH solutions. Some of the other factors that are currently driving the market growth are the influence of NVH and Vehicle Refinement Levels on buying decisions, advanced NVH products with innovative technologies, changing lifestyles and rising incomes in both developed and developing economies. Looking forward, the market value is projected to reach US$ 11.3 Billion by 2024, exhibiting a CAGR of 5.4% during 2019-2024. Based on products, the market has been segmented into polyurethane, mixed textiles fibers, fiber glass, polyester fiber, NBR, polypropylene, PVC, textile materials (synthetic) and textile materials (cotton). Currently, polyurethane is the most popular product type in the global automotive NVH materials market. On the basis of vehicle types, the market has been segmented into passenger vehicles, LCV and HCV, wherein, passenger vehicles dominate the market, holding the largest share. The market has also been segregated on the basis of applications into trunk module, floor module, wheel arches, cockpit module, roof module, engine casing and bonnet liners. Region-wise, Asia Pacific exhibits a clear dominance in the global automotive NVH materials market. Other major regions include Europe, North America, Middle East and Africa, and Latin America. The competitive landscape of the market has also been examined with some of the key players being BASF SE, The DOW Chemical Company, ExxonMobil, 3M Company, Mitsui Chemicals, Inc., Sumitomo Riko Company Limited, Covestro AG, Celanese Corporation, Huntsman Corporation, Lanxess AG and Borgers AG. How has the global automotive NVH materials market performed so far and how will it perform in the coming years? What are the key regional markets in the global automotive NVH materials industry? What is the breakup of the global automotive NVH materials market on the basis of product type? What is the breakup of the global automotive NVH materials market on the basis of vehicle type? What is the breakup of the global automotive NVH materials market on the basis of application? What are the various stages in the value chain of the global automotive NVH materials market? What are the key driving factors and challenges in the global automotive NVH materials market? What is the structure of the global automotive NVH materials market and who are the key players? What is the degree of competition in the global automotive NVH materials market? How are automotive NVH materials manufactured?